After a terrible, horrific, scary loss to Oklahoma State at home, the Jayhawks bounced back with a solid, grind-it-out win against TCU. The fellas break it all down for you including the introduction of your favorite and mine, #MartiniRoomMitch into the starting line-up. 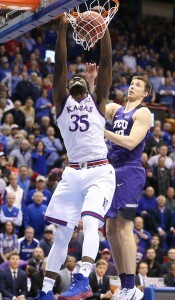 Andrew and Kevin also preview the upcoming Big 12 schedule and do a deep dive into what comes out when you cut KU players open. Rock Chalk Jayhawk! Find the Podcast on iTunes HERE. Find the Podcast on Podbean HERE.